Jeremy Larkin high-steps past a defender. 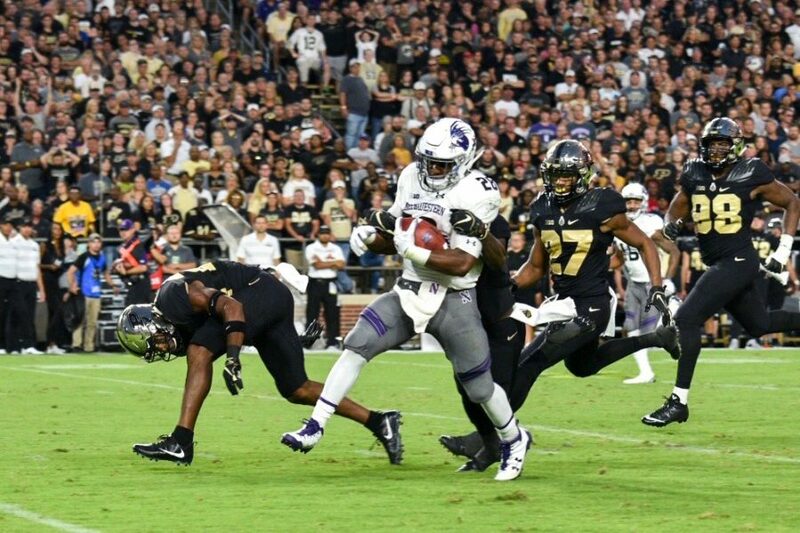 The sophomore running back had a standout performance in NU's win over Purdue on Thursday. WEST LAFAYETTE, Ind. — First, Northwestern fans cheered, when Clayton Thorson started Thursday’s game at Purdue and led the Wildcats to touchdown drives on each of their first two possessions. Then they groaned, when he came out in favor of T.J. Green, and Purdue stormed back. But ultimately, the NU (1-0, 1-0 Big Ten) faithful could cheer as their team managed a 31-27 victory over the Boilermakers, (0-1, 0-1) picking up a key Big Ten win in a season-opening, nationally-televised special. Thorson took the majority of the snaps despite a “pitch count” that required the rotation, and the senior completed a decent 16 of 26 passes for 172 yards. Backfield mate Jeremy Larkin rushed for a career-high 143 yards and two touchdowns, and six players caught multiple passes. Four of the five completed first quarter drives resulted in touchdowns, an offensive pace that slowed markedly as the game progressed. NU built a double-digit lead on two occasions in the second quarter, the latter with an efficient, short-field drive as halftime approached, but Purdue closed each time. The Cats then went cold in the second half, punting on four consecutive drives without scoring as the hosts closed to within four. But the Boilermakers got no closer, as NU ground out time late in the fourth quarter and benefitted from a late-hit penalty on what would have been fourth down. 1. The quarterback wonkiness worked well enough. The first-half switch caused consternation on Twitter and in the press box alike, and Green looked overwhelmed on his opening two series — a three-and-out first, then a 2-of-5 series that stalled in the red zone — as Purdue began to lock in. But Thorson led two touchdown drives on his return and managed to lead NU to a ninth straight win, spanning two seasons, without playing every meaningful snap. 2. Jeremy Larkin shined on the big stage. Questions circled all offseason about whether Larkin, who showed flashes of brilliance as a freshman last year, could replace Justin Jackson atop the NU rushing attack. If Thursday was any indication, he can. Larkin was a consistent playmaker, juking his way to a 46-yard run on the Cats’ second drive and getting all 30 yards of NU’s final touchdown drive before the half. Then, he ground out yards on the game-sealing drive, keeping the ball secure and notching pivotal first downs. 3. The Cats made enough defensive plays. A cursory look at the statistics paints a bleak picture for NU’s defense, which allowed 324 yards on 44 plays in the first half. But the unit also produced momentum-changing plays that led to scoring plays. Sindelar’s three first half interceptions led to a pair of short fields and 17 NU points; a pair of strong open-field tackles limited Purdue to a red zone field goal on a key third quarter drive, and a Jordan Thompson sack in the fourth quarter ended the Boilermakers’ last drive.